It is a system for monitoring the application of adhesive labels scratch-off intended for masking sensitive information (PIN codes of ATM / credit cards) printed on a single A4 sheet in bank documents and be able to verify that all sheets are properly processed. The system is equipped with a matrix camera can capture the image of the document in the area affected by the application of the label and aslo performs the reading and decoding of a code bar-code printed on the document itself, containing the information sequence of the sheet. 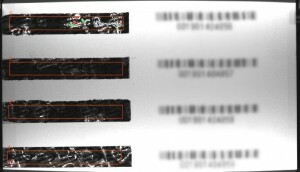 The system is thus able to detect the correct application of the label scratch-off within certain tolerances positional relative to the edges of the document, togheter with the verification of the correct sequence of the sheet.